I first encountered a single vineyard, single varietal, grand cru Champagne back in 1983. 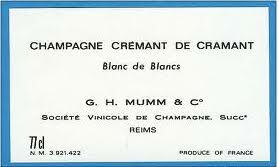 It was Mumm Cremant de Cramant (now called Mumm de Cramant), a 100% Chardonnay Champagne from the grand cru village of Cramant in the Cote de Blancs. I was stunned and it immediately became my favorite Champagne, even though I could only rarely afford it. Since then, I have been exposed to a lot more high quality Champagne, some of it highly promoted and some not. As time has passed, I have become more and more an aficionado of quality Champagne. That journey led me away from a lot of the entry level Brut NV wines sold by the grand marques (Moet, Cliquot, Mumm, Piper, etc.). My initial destination was vintage Champagnes from the grand marques and even a few luxury cuvees. 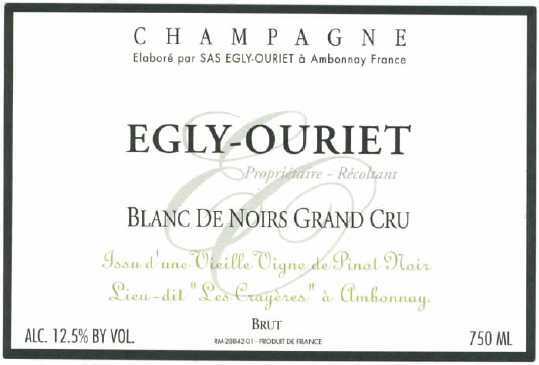 Then in the early 1990s, I first encountered my first estate-bottled Champagnes from Lassalle and Guy Larmandier, and then from Egly Ouriet. Estate-Bottled Champagne? That was a new concept. Up to that point in my career, I had been taught about Champagne from the viewpoint of the big houses (grand marques) that control over 90% of the Champagne market. I knew there were co-ops and I knew there were growers who grew grapes to sell to the big houses but no one had told me (and I didn’t know enough to ask) that some of those growers made and sold their own Champagne under their own labels. So my first introduction to grower Champagnes (aka Estate-Bottled Champagne, aka Farmer Fizz) was from Larmandier and Lassalle and Egly Ouriet. I like the wines but really didn’t understand them. I had always thought house style and consistency were the hallmarks of good Champagne. At least that was what I had been taught in the Champagne gospel according to the grand marques. I didn’t know that idiosyncrasy and terroir specificity had a place in Champagne. But I was learning. The mid-1990s brought me more and more exposure to grower Champagnes but I had a hard time embracing them. Some were highly touted but did not give me any pleasure. Maybe they were over-hyped in the wine community and wine press because they were THE NEXT BIG THING. Some were just too dry (lots of Extra Bruts and no-dosage-cuvees) without the aging or reserve wines needed to round them out. And some were frankly not very good but still got the buzz (not unlike a restaurant that a critic loves but consistently disappoints when you go in). After the turn of the millennium, I began to encounter more grower Champagnes that offered the idiosyncrasy and specificity I wanted combined with more accessible but still dry dosages and the richness and development that comes from reserve wines, time on the yeasts, and tweaking the wine making. Now, more than ever, when I pick some bubbles to drink, I find myself Selecting Grower Champagne.